For example, you bought 64GB flash card. It shows 64GB, looks like 64GB, smells like 64GB... it must be 64GB? Not always. There are many sellers who are selling re-marked flash cards. For example, the card may be 8GB inside, but stamped "64GB" on the outside. The problem is that this card can store up to about 8GB of data, while anything higher will be lost. Unrecoverable. 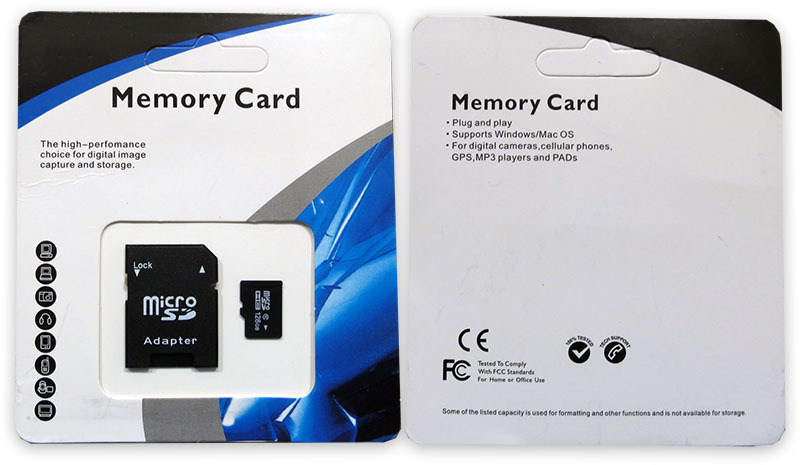 In general, each Micro SD card has two main parts: microcontroller and raw flash chip. While the flash chip has its fixed size (i.e. 8GB), the microcontroller can be programmed to report anything. This way a fake card's microcontroller reports 64GB, while the flash chip stays 8GB. Your Windows may show 64GB when you check for the size in card's properties, but Windows does not really measure or check the size. All it does is asks the card's microcontroller about its capacity and if the microcontroller was re-programmed to report higher capacity, you'll see what card had decided to report, not what the card can actually store. Some sellers know exactly that they are selling fakes, some may not be even aware of it. Our goal is to try to properly spot the card before purchasing, and be able to verify if you already purchased it. I recently got about 20 64GB Micro SD cards for some project at various online sources (eBay, Ali, etc). 17 of those cards are fake. So I decided to check and make a pattern for others to be able to recognize fake before purchasing and wasting your time. That means if you get 64GB or higher, it must be SDXC. If you see "64GB SDHC" or "64GB MicroSDHC", this is 100% fake just because "64GB MicroSDHC" is oxymoron. Please note how SDXC logo differs from SDHC logo. As mentioned earlier, if the card you are buying is 64GB or higher, but the packaging said "MicroSDHC" or "SDHC", then this is fake. Also, sometimes packaging does not match with the card. 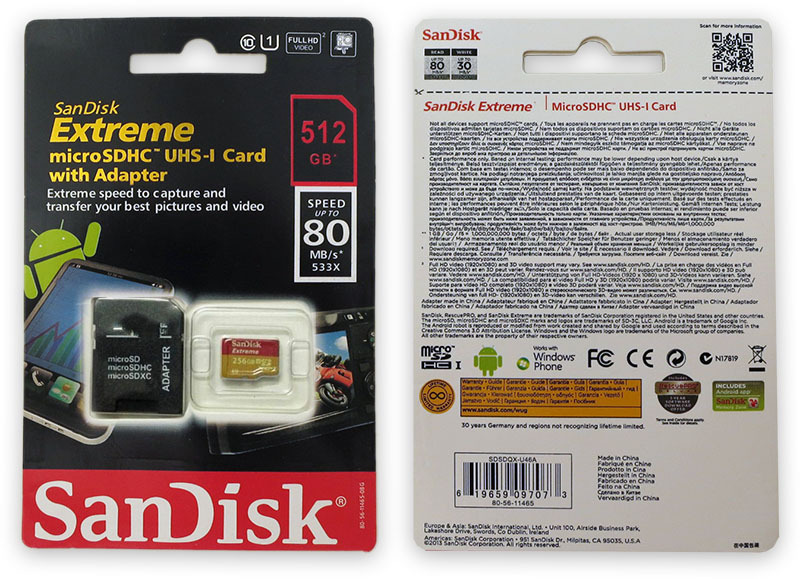 I saw same seller who had packaging with "Sandisk Ultra", but the card inside had "Sandisk Extreme" on it. This is fake too. I even saw some cards where packaging said "Class 10", but the card had "(6)" on it. That's another reason to believe this is fake. And of course, if the packaging said "MicroSDHC", but the card has "SDXC" logo or another way around, this is fake. The back side sometimes may have a lot of stories to tell. One of easiest ways to check is to get the UPC and look for the correspondent product assigned to it. If the product does not match with what the packaging said, this is fake. Also, you can just look for misspells on the back side. It seems like when the packaging is copied from the original, all texts is copied manually so there are some mistakes during re-typing. If you know other languages which are included on the back of the packaging, then your best bet to check there because non-English translations usually have more issues like that. First, check to make sure the family of card matches with its capacity. For example, SDXC logo must be present on all cards 64GB and higher. If it does not match, this is fake. Also, you can check on the manufacturer's website to see how the card looks like. 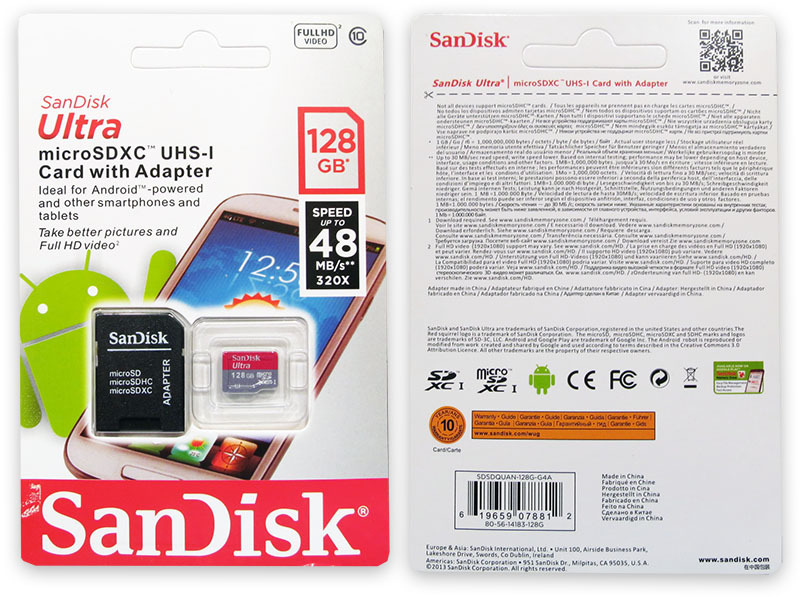 For example, I saw several Sandisk 128GB Micro SD cards colored differently from the original Sandisk as shown on Sandisk website (that's despite showing "SDHC" instead of expected "SDXC" logo). Additionally you can compare the original picture from manufacturer's website and look for any differences. Most of the time font type is different and alignment is off. The same part number was on all fake Micro SD card I got. All of them. It appears that "08" part in the part number shows the actual capacity of the card -- 8GB. If you see such part number on the back, this is fake (unless you bought 8GB which is unlikely). Some known variations are: MMB3R08GUACA-GE, MMB3D08BUACA-GE, MMB3D08GUACA-GE, MMB3R08GUACA-GE. If you could not spot the card using any methods above and you purchased it, but still suspects that the card may be fake (works too slow, losing data, etc), then you can test it. Based on the fact that fake cards reports higher capacity than what it can actually store, the easiest way to check is to try to store some data and see what you could read back. As shown on this screenshot, the card was successfully verified up to 7.7GB only. The rest of the capacity does not exist. Usually, an original card has slightly less capacity than listed due to recovery mappings, system-related areas, etc. For example, you may have 60-62GB instead of 64GB which is normal and expected. The fake cards are usually pretty close to 64GB. I got a few fakes which were showing 65GB. Additionally, the speed of writing and verifying should be higher too (the card was marked as being "Class 10 UHS-I", but that's a minor factor in this case. If you suspect the card is fake (too slow, losing data, etc), check it with h2testw or similar tools. I would highly suggest to check all cards just to make sure and avoid losing refund time period. After you verified the card and confirmed it's fake, report it to the seller. Explain politely that you received the card and verified to be much lower capacity and speed. You can even redirect the seller to this page if you feel like seller may not be aware of selling fakes. Ask for a refund. I found that most sellers will refund your money quickly and without any issues. If you don't get response from the seller, then go higher to request a refund through the company you used to purchase -- eBay, PayPal, Amazon, etc. Don't wait, or you'll just forget about it. Once refunded, either mark the card as being fake, repartition and reformat it to the actual capacity (re-check using h2testw after) or destroy it in order to avoid accidental data loss. I tried to contact several sellers about it and I got various excuses. Some of them looks pretty honest and it's possible that some sellers honestly don't know what they are selling. But some excuses are pretty clear that a seller is perfectly aware that they are selling fakes. The more "pushy" seller is, the highest chance he knows exactly this is fake. The most popular one: "the card was upgraded by 3rd party, so it's 128GB now". What? Are they serious that someone could actually "upgrade" Micro SD card to a larger capacity? The flash chip is embedded into the card so it's basically was produced as a solid single piece of silicon+plastic on the factory. That's not possible to remove it and replace it. The only way to "upgrade" it is to convert it to a fake card with falsely reports a higher capacity and making you lose data when you exceed the original capacity. I see this one often: "Windows reported it as 64GB, then this is 64GB". As mentioned earlier, Windows does not check the capacity. Instead, it just asks the controller about it and report it back. That does not guarantee that the actual flash capacity matches with what controller reported. The other one: "to save the cost, this 64GB card is marked as SDHC instead of SDXC". The cost does not depend on the SDXC/SDHC logo on the card and package. Seller clearly gives a bogus information. Here is more: "your devices does not support 128GB". Well, some readers may act differently. However, even if your reader is older SDHC without SDXC support, it will still be able to access up to 32GB, not just 8GB. Basically, it will either access up to 32GB or won't read the card at all. Nothing in the middle. I like this one: "this card is 100% genuine. But you can not use h2testw to test because this utility is designed for USB drives only and does not support Micro SD cards". This is clearly fake and seller knows what he is selling. The h2testw and similar utilities don't even care if the card is Micro SD, Compact Flash or anything else as long as it has filesystem and you can write files to it. 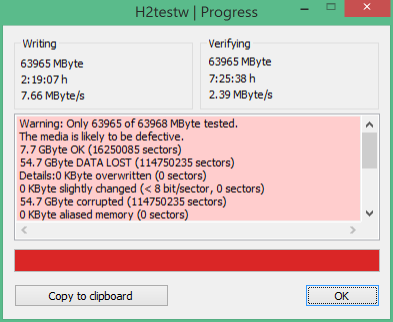 You can even test your own SATA Hard Drive using h2testw. Not to mention that most SD card readers act as USB drives anyway. Here is a funny one when I asked about typos on the package: "Sundisk just made several typos on their package, but this is still 128GB SDHC". I don't believe that SanDisk will ever release a product with a lot of typos on their retail package. Not to mention there is no point to release packages with typos and without typos at the same time. Also, I see some sellers put "This is genuine 256GB Micro SD card because I bought it from genuine source". Sandisk does not even have 256GB Micro SD card, never produced it yet as of now. When I ask sellers "why", I got someting like "Sandisk forgot to update their website". How about this one when I asked why Samsung does not list that particular 512GB Micro SD card on their website: "I work for a special tech department in Samsung and this is a very secret product which Samsung did not launch yet, but they let us keep it". Yeah, right. In this case it's pretty obvious the seller knows he is selling fake. Even though some sellers clearly know that they are selling fakes and so provide with lame excuses, some other sellers come to a surprise when they start to investigate more and follow suggestion to check using h2testw or similar tools. So you should be easier when you communicate with your seller, as some may actually not be aware of it because they just blindly trusted to their source without realizing that some flash cards may be fake. Here are some real examples and my own comments on how each card can be recognize as being fake. This is fake Sandisk Ultra Micro SD card. The font used to write "128GB" on the card does not match with the one used on Sandisk website for the same card. UPC is 619659078812, model is SDSDQUAN-128G-G4A. The model corresponds to 128GB Micro SD card, but the color is different. The original card of this model is black colored and red writings on it, not like this fake. The actual capacity is 8GB. This is fake Sandisk Extreme Micro SD card. 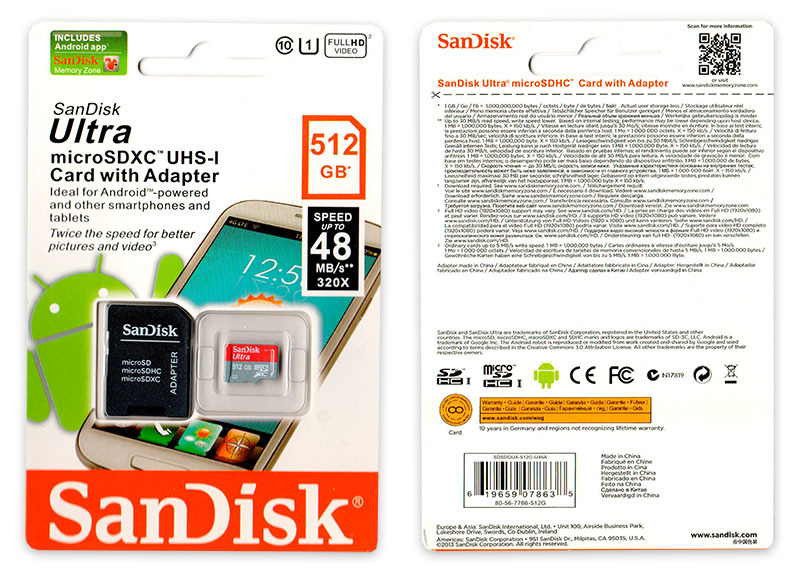 Clearly, the packaging is from a different card (Sandisk Ultra). It did not say the capacity of the card anywhere on the package. 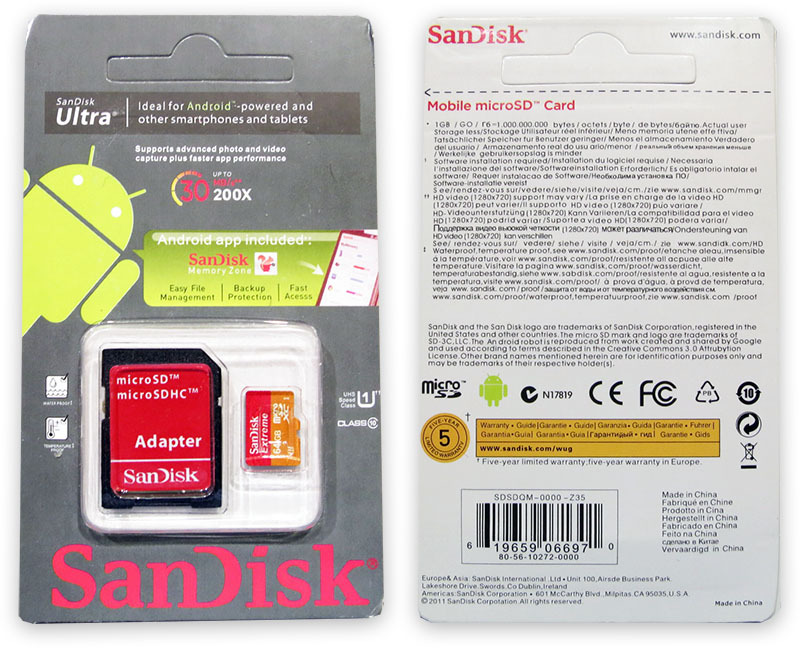 The back of the packaging has invalid model SDSDQM-0000-Z35 (the actual Sandisk model has capacity size in place of "0000"). UPC is 619659066970, it corresponds to Sandisk 2GB Class 2 Micro SD card. One more example of fake Sandisk Extreme Micro SD card. As you can see the package said "SDHC" on both sides. Also, the sign "microsDHC" on the front has wrong capitalization spelling. The back side of the package has low quality printing so it's not easy to read, especially on the yellow sign. The backside has a few misspellings too (i.e. "MB/s" vs "Ma/s"). One of the important fact is that Sandisk does not make 128GB cards in Micro SDXC format as of now. The highest available Micro SDXC Extreme is 64GB only. The printed part number SDSDQX-128G-U46A does not even exist. UPC is 619659097073 which corresponds to 16GB card. Another example of fake Sandisk Ultra Micro SD card. As you can see it has "Micro SD" logo instead of "SDXC". The back has a lot of spelling errors. The model is SDSDQM-0000-Z35 which does not even exist. UPC is 619659066970 which corresponds to 2GB Micro SD card (that's probably the reason for "Micro SD" logo instead of "SDXC" or even "SDHC"). This is one of the crazy fakes. The card marked as Sandisk 512GB. At the time of writing, Sandisk did not produce 512GB Micro SD card yet. 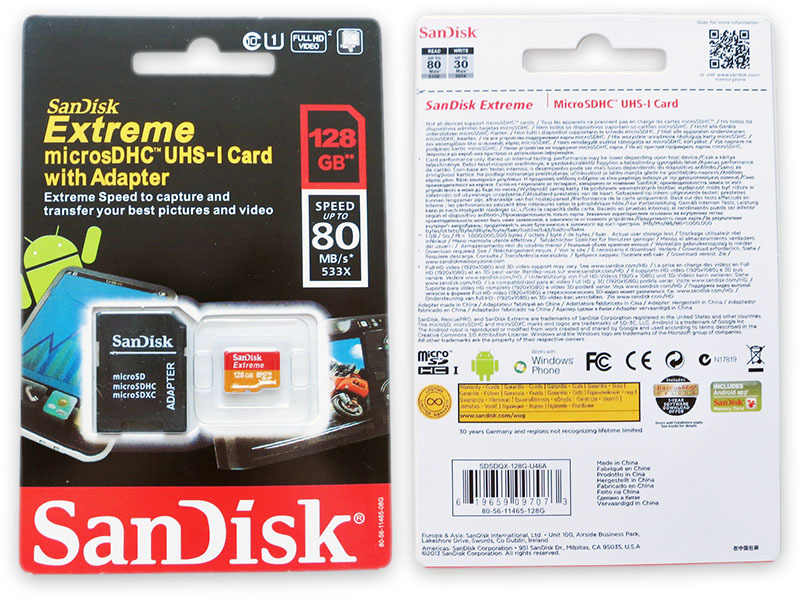 The highest capacity of Sandisk Extreme Micro SD is 128GB. Let's pretend we did not notice that. Let's see at the package: front said "microSDHC" (wrong capitalization and "SDHC" part) and, wait a minute, the package said 512GB, but the card is 256GB. I bought it as 512GB, but I guess the seller was so desperate to sell, so a wrong card was packaged. As usual, the back has wrong "SDHC" logo and wrong model SDSDQX-U46A which does not even exist. UPC is 619659097073 which belongs to 16GB Micro SD card. The same as above: Sandisk never made 512GB card yet. The highest capacity of Sandisk Ultra Micro SD is 200GB, not even 256GB. 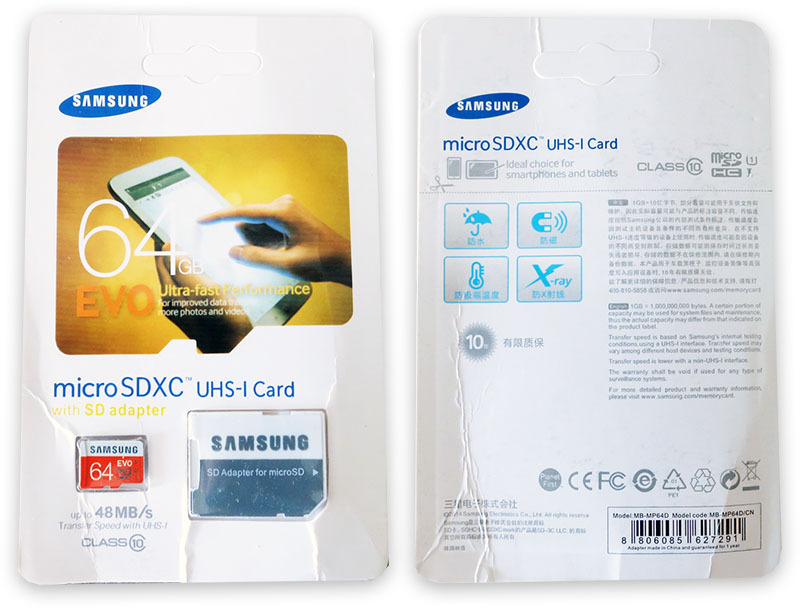 The front of the package has incorrect capitalization of "microSDXC" sign, the back said "SDHC" despites front saying "SDXC". The model is SDSDQUA-512G-U46A which does not exist. UPC is 619659078635. That's not a valid UPC. Here are two more examples of fake card which are trying to fake a real brand. AFAIK, all major brand names show the actual capacity of the card on the packaging. These card have generic packaging with no capacity markings. Funny thing is that the card in the middle has marking on the card put upside down. As usual, both packagings show "SDHC" instead of "SDXC". And cards have "SDHC" logos too. The back side of the packaging has UPC 4718050601189 for both 128GB and 64GB cards. The UPC corresponds to ADATA 2GB MicroSD card. Here is fake Samsung 128GB EVO Micro SD card. The card uses a wrong font for "128" part. 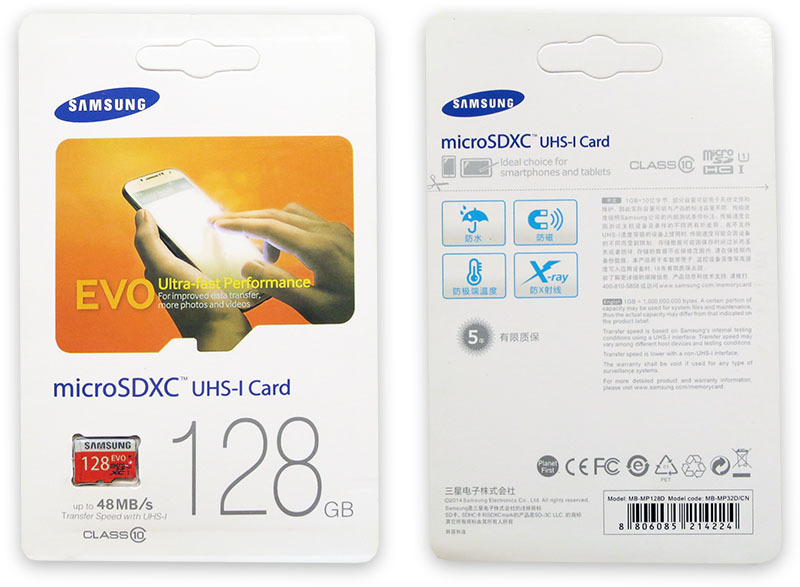 The packaging does not show capacity of the card and also does not match the card (packaging shows "SDHC", but card has "SDXC"). UPC is 8806085214224, that belongs to Samsung 32GB Micro SDHC card. Here is one more example of fake Samsung 64GB EVO Micro SD card. First think I noticed is a very low quality of the picture on the front of the package. I looks like low quality ink jet printer (compare with the one above). 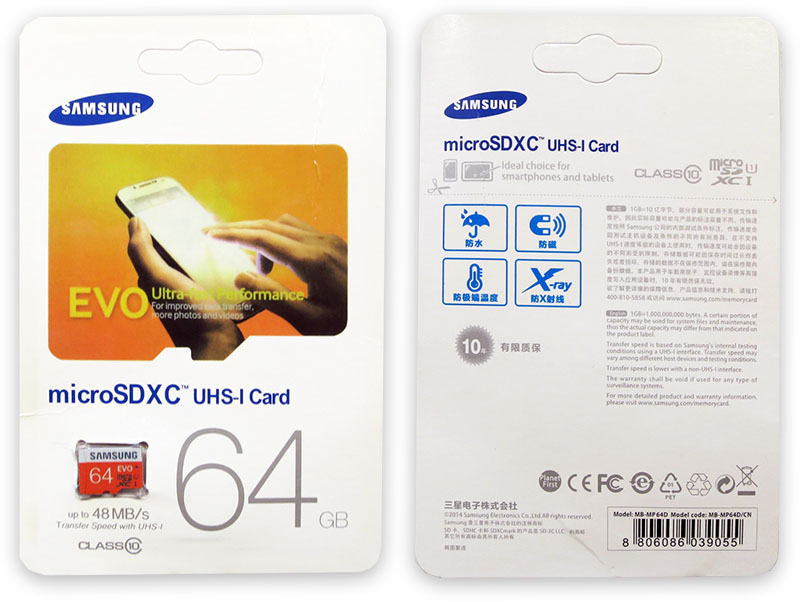 The card marked as "SDXC", the front of the package shows "SDXC", but the back of the same package shows "SDHC". Seems like sides of the package were combined from two different ones. UPC 8806085627291 belongs to 16GB Micro SD card. Here is another example of fake Samsung 64GB EVO Micro SD card. Although, this fake looks better than other ones, but it still has a very low quality of the picture on the front of the package. Note how "fast" part is blends with the background image so it's not easy to read. The original one does not have such issue. Additionally, if you feel how the plastic holder mounted inside, you'll notice that the plastic insert is kind of short and does not go as wide as the package, while the original one does. The card itself has slightly different colors, for example the original card has "SDXC" logo in gray color, while this fake has it in black. Also, the original card has white color on the side of the card right across the edge, while the fake card's paint stops just before the edge. Samsung also said that their cards are made in Korea and Philippines only, you should not see "China" on Samsung cards. The included adapter is made in China only, but not the actual card. Although, this may change in the future. UPC 8806086039055. Surprisingly, the UPC appears to be correct. Another non-existing card as Samsung did not produce such capacity in Micro SD format yet. 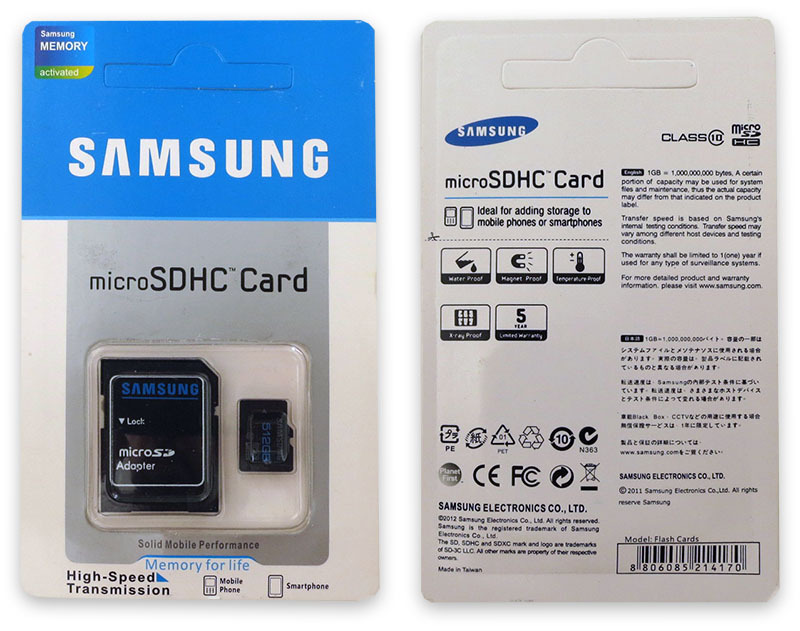 The front side has low quality picture with hard to read letters, wrong capitalization and type in "microSDHC" (even though the card said "SDXC"), the back said "SDHC" which is incorrect. Model number is missing. UPC is 8806085214224, that's Samsung 32GB Micro SD card. The same issues as above card. Model is "Flash Cards". What kind of model is it? Without even checking Samsung website I can say this is a non existing model. UPC is 8806085214170. Seems like this is not a valid UPC. One more example of a fake Samsung 128GB EVO Micro SD card. The card does not have white color around the edge as other fakes and uses a wrong font for "128" sign. Coloring on the card does not match with original colors compared with Samsung website. The same very low quality of the picture on the front of the package. The front of the package said "SDXC", but the back has "SDHC" logo. Also, it has "MB-MP32D/CN" part number next to the UPC barcode which corresponds to 32GB card. UPC is 8806085214224, that belongs to Samsung 32GB Micro SDHC. 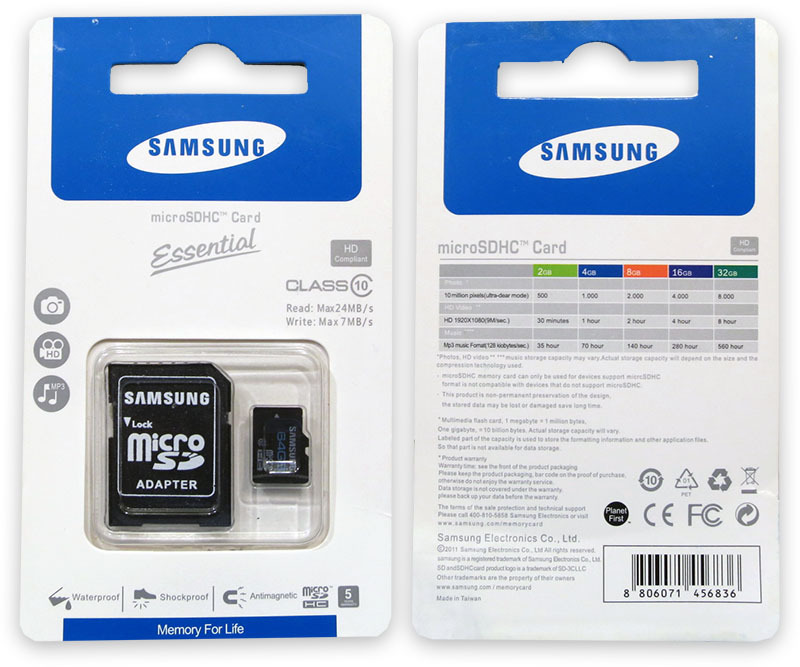 Here is another fake Samsung 64GB Micro SD card. The card marked upside down too. No actual capacity is displayed on the package. 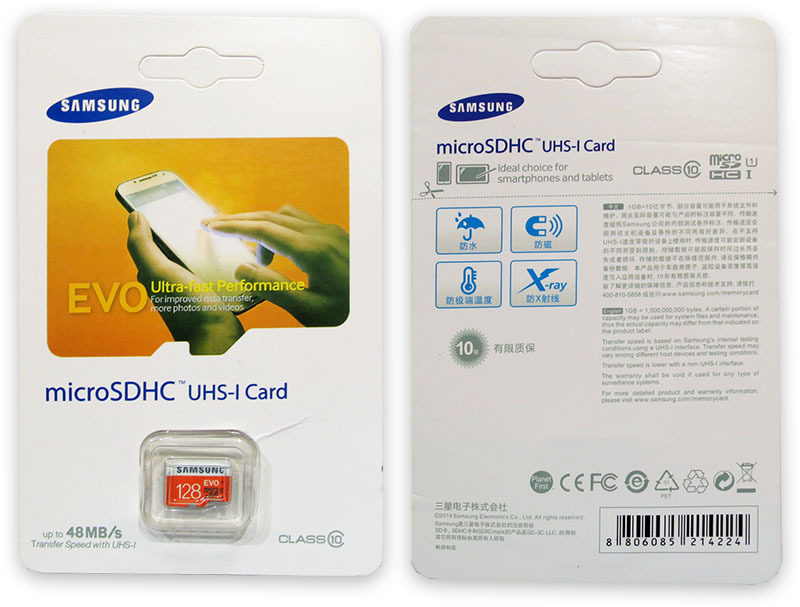 The package and the card have "SDHC" instead of "SDXC". The back side of the package shows a table with various card sizes, but not 64GB. That's because the table is for SDHC, while the card is suppose to be SDXC. 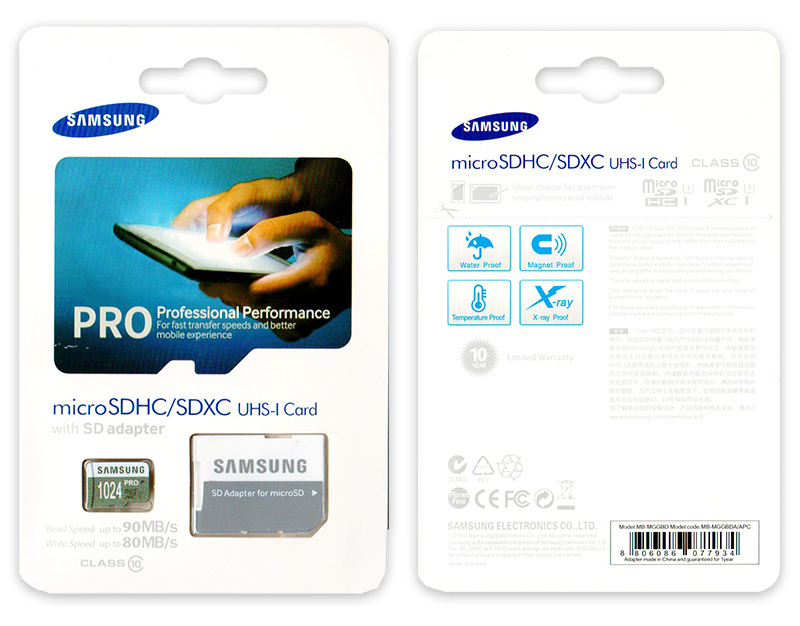 UPC is 8806071456836, which associated with Samsung 4GB Micro SDHC card. Yes, this is 1TB Micro SD card. The card which does not exist from any manufacturer at all. But it exists as a fake card. Besides being marked as "1024GB", the card has both SDHC and SDXC logos on the back. Obviously, the card can't be both SDHC and SDXC at the same time. The printing and coloring on the card looks like a very cheap ink jet printer. The "SDXC" logo on the card is barely visible at all due to low quality printing. The Model is MB-MGGBD and model code is MB-MGGBDA/APC. Both do not exist. UPC is 8806086077934 which appears to be from 32GB Micro SDHC. This fake card is being sold at very low price (about $5-$10 for 64GB and about $10-$12 for 128GB). This card is simply too generic to believe. There is no UPC on the back. It has "SDHC" logo instead of "SDXC" (128GB exists as SDXC only). I like the marks "100% tested" and "Tech support". What tech support? There is no even contact information on the package. 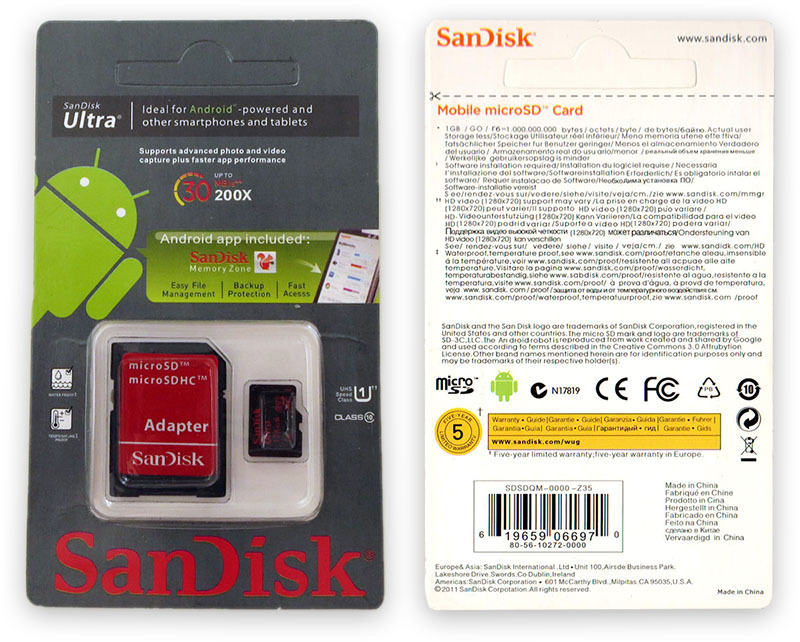 Here are the backs of the following fake cards: Sandisk, 2 x Samsung, ADATA and Generic. Can you guess which one is which? Yes, they all have the same part number on the back -- MMB3R08BUACA-GE.